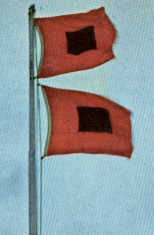 LEE, last communique before the storm: "Charley hasn't made landfall yet. No telling yet just where it'll land." Hurricane Charley came as a surprise to us in Charlotte County We knew it was in the Gulf of Mexico but for days it was consistently aimed at Tampa. It was considered such a sure hit there that they evacuated the barrier islands and lowlands around Tampa Bay, anticipating a 10-15 foot flood surge with it. My next door neighbors' daughter goes to college up there, so she came home to be safe. Here, we began prep for the usual high winds and heavy rain we experience as a hurricane passes nearby. I got my yard cleared and my storm awnings down. Then around noon on Friday the 13th, 2004, Charley took a jog to the side, and the Ft Myers area went on warning. But about 2:00 PM, very suddenly, Charley jogged north - directly toward us - and increased in intensity to Category Four. That's on a scale of 1 to 5. The hurricane's eye swept directly up Charlotte Harbor, with the right side of the eye wall hitting the town of Punta Gorda on the bank of the harbor, and the left side going over us, spawning small tornados as it traveled. Winds as high as 176 mph were reported in Port Charlotte. We were warned to expect a storm surge of as much as eight feet. But going directly up the bay, Charley sucked the water level down by about four feet. The following surge filled it up again instead of flooding us. Charley was a small intense storm with a small intense eye. Instead of losing punch over land, it maintained its energy as the eye went up Charlotte Harbor and the Peace River. It slammed into the towns up river almost as hard as it hit us. I followed it on the TV radar until my electricity went off around 4:00 PM. Then I went to a portable radio for news until our local station went silent. Most of my windows were covered, except for those in the Florida room (Real Estate-speak for Sun Parlor), so I didn't see much of the actual storm, just the trees in my backyard thrashing and the bigger loquat collapsing. But I sure heard it. Wind wailing, stuff bouncing off my roof, antenna guy wires snapping, and the horrible noise of my three-legged TV tower pulling its bracket off an eave and snapping at the base to topple into the crepe myrtle next door. Luckily, that's all it hit. The crepe myrtle survived. My antenna didn't. My Florida room and utility room are part of the house, but under their own separate (gravel) roof. Charley peeled off that roof, baring boards that must have shrunk since they were first installed. Water poured through the cracks between them. Saturated, the ceiling and insulation above it came down in chunks. One very large heavy piece of that roof evidently bounced onto the house roof, banging up a ridge vent and ripping off some shingles. Then it slammed into the house next door, smashing a window, knocking their air conditioner off its pad, breaking their phone lines, and doing some other damage before it landed in my yard. Compared to the rest of the area, the houses in this immediate neighborhood were extremely lucky. They lost lanais (screen rooms with aluminum roofs) and pool cages and suffered roof damage, but very little worse. Pieces of lanai roofs went all over the place. I'm told the pieces in my front yard came over my house from across the canal. The big combination lanai and pool cage next door was said to have gone over their roof and off into the distance. Of course, trees were down everywhere. Both of my loquat trees were uprooted and some limbs were broken off my oak tree. A huge old pine tree across the street was bowed but unbroken. The trunk bent about five feet above the ground until the whole upper part of the tree was parallel to the ground, and it stayed that way until it was taken out days later. The storm passed quickly. Before nightfall, some of us were wandering out into the street to survey the situation. It was several days before I saw any of the damage further away. That's when I realized just how lucky we were. Just a few blocks from here, my friendly neighborhood hardware store was totally flattened, as were many of the businesses along U.S. 41. A number of houses in that area were badly damaged, some so badly that they were later demolished. Utility poles were down and electricity was off throughout the county. The local radio station lost roof, electricity, phone lines and their cell phone link, but within a few hours after the storm they got on air on a generator. The first night they were calling for supplies of diesel fuel. Listeners came through with enough to keep them going til they could get it from the usual sources. The public safety building in Punta Gorda was thoroughly bashed. They lost their communications system. Amateur radio operators from RACES (Radio Amateur Civil Emergency Service) rushed to fill the breach. Hams set up at the Emergency Operations Office and various other places. One set up at the radio station so that the harried announcers could keep the public informed of what was happening and where they could find shelters, supplies and other help. Most phone cells in the area were down but not all. Several people provided the announcers with their phones so listeners could call in with questions and offers of help. According to one irked announcer, national TV reported that looting was rampant here and we were under martial law. Actually there was relatively little looting and our "martial law" was National Guard working emergency response and directing traffic. The county instituted a 9:00 PM-6:00 AM curfew, in part to make things difficult for looters, but mainly to clear the streets of traffic to make it easier for the work crews trying to clean the streets of debris and restore electric service. No electricity meant no coffee the next morning. I resorted to a room-temp cola instead. Breakfast was half a peanut butter and jam sandwich. I devoted most of that day to dragging hunks of debris from my yard to streetside for eventual pickup. The next morning when I took my warm cola and settled in a lawn chair in the shade, hoping for an occasional bit of breeze, the lady from across the street came over and joined me. She mentioned how much she longed for a cup of coffee. Well, several years ago I'd bought a little Sterno stove for my hurricane kit, but the way things were I was leery of using it. I gave it and a jar of instant coffee to her. She went home with them. After a while, she returned with hot coffee for both of us. From then until the electricity came back on, each morning she brought me a cup of hot coffee. During the following days, I did clean-up in the yard and worked Search and Rescue on my Florida room and utility room. Most of the furniture was too thoroughly drenched to salvage, as were many of the boxes of papers and magazines stored out there. But much of the stuff in drawers and on shelves was okay. I got busy dragging the salvage into the house and into the garage. It was amazing how much I had stored out there. Marvelously, the decorative glass items I had on shelves in front of the windows were all okay. I got them into boxes and into the house. The next day a piece of ceiling fell on the display unit and broke the top shelf. Sheriff's deputies or some volunteer group came by every day giving out ice and bottled water. One day a Red Cross canteen truck from Mississippi came by and doled out hot dinners to all who asked for them. Very good beef stew, green beans and canned peaches, plus some cookies and crackers and a Trail Mix bar. The Red Cross and Salvation Army set up canteen trucks in hard-hit areas to provide hot meals. Supplies were being given out all over. One day a man from a nearby community stopped and asked if I could use some ice. He and his wife had frozen a lot of bottles of water. He'd brought them down to give to people here who needed them. One day a bunch of teenagers in a pickup truck came through distributing bags of toiletries and snack foods. Someone left a small box with individual-serving cans of food, and snack foods, by my front door. A truck giving out water and ice also left a large carton that turned out to contain seventy-two MRE pouches of chili and macaroni. What I couldn't use, I passed along to neighbors. The amount of help that came into the area was awesome. Workers and volunteers poured in from all over the country. Convoys of semis bearing supplies, work trucks from power companies and flatbeds loaded with utility poles, were reported for days. Electric company trucks were spotted from as far away as Wisconsin. At the high point, it was reported that 10,000 workers were struggling to restore electric service in this county. The mess in my Florida room was too much for me. I called one of the volunteer lines for help. A few days later, a crew of young people from the Florida Jaycee Disaster Relief Foundation showed up. They dragged out the ruined furniture, shoveled out most of the fallen ceiling and insulation, ripped up the sodden carpet and took down the ruined ceiling fan for me, and hauled it streetside for pickup. When they'd finished with their own debris, my next door neighbors came with a chain saw and cut up my fallen trees and broken limbs and hauled them streetside. My TV tower and antenna were ruined. I figured it'd be a long time before I could get a new outside antenna up. But soon after the electricity was back on, my nephew Gary called to tell me he'd put out the word to the ARRL (American Radio Relay League), and had heard from a ham in a nearby town who would come with a buddy and put up a new antenna for the cost of the materials. These two guys, Vic Emmelkamp, K4VHX, and Frank Maren, W4VV were total strangers to me and to Gary. They drove to another town to get the parts, and spent hours in the heat getting an antenna up for me. Next to the damage, the worst of it here was the lack of air conditioning, Even with all possible windows open, my bedroom was a sauna. But it was the lack of electricity that also made for the nicest parts of it all. Everybody was spending time outside, doing clean-up and repairs. I was alternating clean-up with resting in the shade. It was like the old front-porch days, with neighbors pausing to rest and chat a while. After nine days, the electricity on my side of the street came back on, and a few days later that across the street. Within two weeks of the storm, Florida Power & Light announced that everyone who could accept electricity had service. People turned on their air conditioners and went back indoors. At last, I enjoyed a warm shower and a good night's sleep. But I kinda miss having company as I have my morning coffee.